By Jordyn Grzelewski, Justin Wier | June 21, 2018 at 12:01a.m. 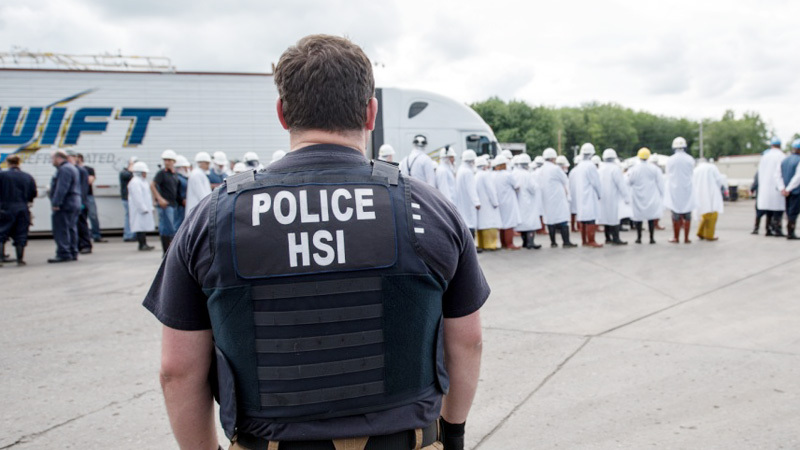 Local activists and charity organizations have mobilized to help those affected when U.S. Immigration and Customs Enforcement detained 146 workers at a Valley meat-processing plant Tuesday. It was the largest workplace raid carried out under the Trump Administration, an action that earned rebukes from civil-rights organizations and union officials and accolades from Republicans. ICE agents locked down Fresh Mark’s Salem facility about 4 p.m. Tuesday and loaded workers suspected of lacking proper documentation onto buses. The workers were primarily from Guatemala, an ICE spokesman said. The agency also served warrants for documents at Fresh Mark locations in Massillon and Canton. Tuesday’s raid resulted from a year-long investigation based on evidence that Fresh Mark may have knowingly hired workers in the country illegally, according to a statement released by ICE. Brittany Julian, director of corporate communications for Fresh Mark, said the company has partnered with ICE in its ICE Mutual Agreement between Government and Employers, or IMAGE, program which requires Fresh Mark to participate in E-Verify, and to conduct a yearly audit of those forms. E-Verify compares information on employment eligibility verification forms with government records. “This program between the U.S. government and private employers ensures a lawful workforce,” Julian said. The Massillon-based meat-processing company employs about 2,800 workers. It produces bacon, ham, hot dogs and deli meats under brands including Sugardale and Superior. Stuart Applebaum, president of the Retail, Wholesale and Department Store Union that represents Fresh Mark employees, said he was outraged by the raid. Jeff Stewart, who leads the Immigrant Worker Project in Canton, said he was in Salem until about 1:30 a.m. Wednesday working with those affected by the raid. Stewart said the mothers of children who had been left on their own have been released. ICE also released several people who had ongoing immigration cases and others in the country legally who did not have proper documentation at the time of the raid. The agency said the releases were for “humanitarian considerations” including health and family concerns. Stewart said the raid is an unfortunate consequence of a broken immigration system that fails to take economic circumstances into account. “We’re almost at full employment at this point, so there’s a need for workers to keep the economy going,” Stewart said. He added that several undocumented workers have been in the country for years and decades and have no criminal record. Since then, Stewart said, they’ve paid taxes and contributed to their communities. “They deserve to come out of the shadows and gain legal status,” he said. The activity in Salem followed a raid earlier this month in Sandusky that saw 114 workers at Corso’s Flower and Garden taken into ICE custody. Many of those detainees have been housed at CoreCivic’s Northeast Ohio Correctional Center on Hubbard Road. Stewart said it shouldn’t come as a surprise that Ohio has a large immigrant population because it’s a highly agricultural state. That need for workers extends to agricultural-adjacent jobs such as those at the meat-processing plant in Salem. About 503,911 immigrants live in Ohio, according to data released by the American Immigration Council, an advocacy group founded by the American Immigration Lawyers Association. Those who entered the country illegally account for about 95,000 of the state’s immigrant population and paid an estimated $83.2 million in taxes in 2014, according to the association’s website. Immigrants comprised 5 percent of the state’s labor force in 2015, according to the report. Family members of those detained can call ICE’s 24-hour detainee locator hotline at 1-888-351-4024. The hotline operates in English and Spanish and will answer questions about a person’s detention status and the removal process. “Please join us in praying for the families affected and for just immigration reform,” the statement said. Also responding to the news of the Fresh Mark raid was Lina Adi, whose father, Amer “Al” Adi Othman, was deported by ICE earlier this year after living in the U.S. for more than 30 years and raising four children here. Othman was a downtown Youngstown business owner. Adi, 25, noted her separation from her own father and said she couldn’t imagine how difficult it would be for a young child. “I couldn’t imagine how they feel,” she said. In a Facebook post, she called on community members to support those affected by the Salem raid, particularly children whose parents were detained. J. Bennett Guess, executive director of the Ohio American Civil Liberties Union, said the recent actions taken by ICE in the state are on an unprecedented scale and the organization is monitoring it with great concern. He added that the employers who hire workers like the ones swept up in the raids are rarely taken to task. “These are people who are exploited by employers and then treated harshly by immigration officials,” Guess said. Three men who represent the Valley in Congress had different reactions to Tuesday’s event. The Cleveland Democrat expressed a desire to find a bipartisan solution that creates a pathway to citizenship for law-abiding U.S. residents who work and pay taxes. U.S. Rep. Bill Johnson of Marietta, R-6th, whose district includes Salem, said the raid proves America is serious about enforcing its immigration laws. “When we finally secure our borders, there will be less need for raids like this,” Johnson said. He said we should have an open heart to citizens of other countries who need asylum, but we must put American citizens and American interests first. He added that the country can accomplish that without separating parents from their children. U.S. Rep. Tim Ryan of Howland, D-13th, said the raid highlights the need for comprehensive immigration reform. “While we wait for more information about this most-recent ICE raid, it is important that before anyone is deported these individuals — many of whom have families and strong ties to our community — receive full due process,” Ryan said. June 20, 2018 1:16 p.m.